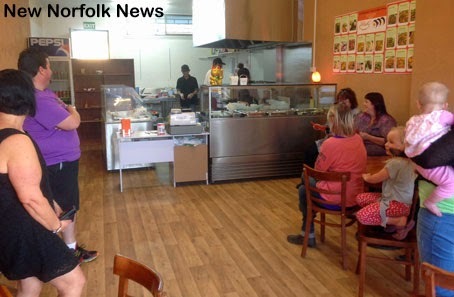 Inside Alexia's Noodle Plus at 5 High St.
NEW Norfolk's first noodle shop appears to be doing a roaring trade since opening on Friday afternoon. Located at 5 High St, Alexia's Noodle Plus promises an authentic taste of Asian cuisine using fresh Tasmanian ingredients. There are reports that opening day was so successful the supplies were sold out an hour before closing time. There was a good crowd in the shop soon after it opened this afternoon. The restaurant and takeaway will open from Tuesday to Sunday for lunch and dinner. The advertised trading hours are 11.30am-2.30pm and 4.30-6.30pm. The menu is posted in the window and includes noodles, fried rice, soup and sushi. This new restaurant is not the previously reported noodle bar approved for 63 High St, of which nothing further has been heard. A comment has been submitted by a clearly dissatisfied customer of the new noodle shop, but it's a bit too extreme for publication. Ed was underwhelmed by the rice dish he tried at the weekend, but has heard rave reviews from those who have sampled the Singapore Noodles in particular.